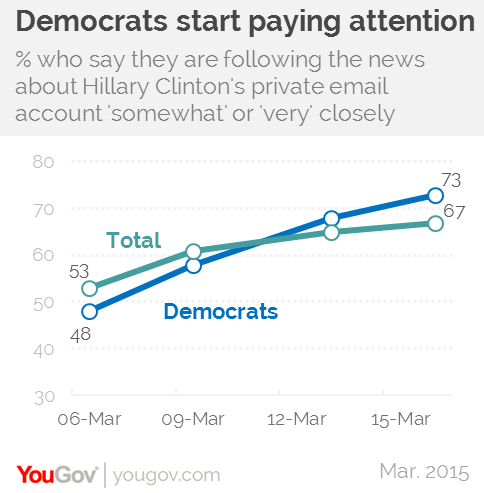 Tracking the Clinton email controversy: Democrats rally? March 21, 2015, 1:08 p.m.
Hillary Clinton has been a public figure for more than two decades, and many opinions about her character and competence have changed little in the last few years. Questions about her emails while she was Secretary of State may also prove to have relatively little impact on her standing in the race for the Democratic nomination, according to the latest Economist/YouGov Poll. In fact, after her press conference last week, there may even have been a rally effect among Democrats. 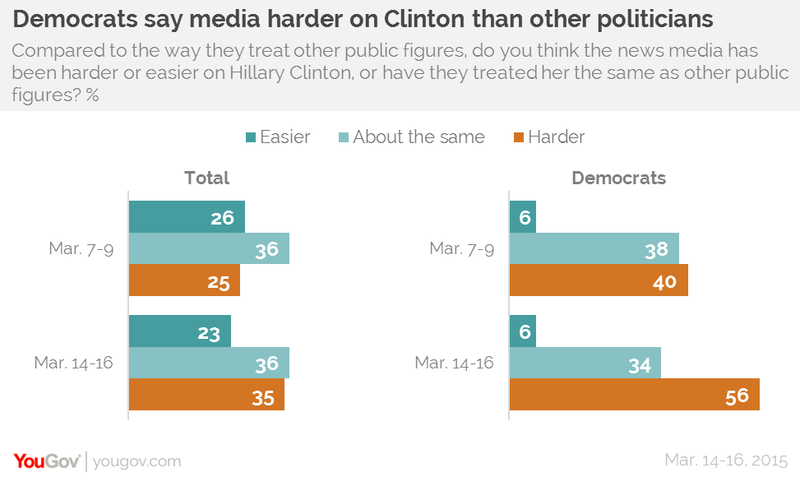 The biggest change post-press conference, in fact, was the increased perception that the media treats Clinton harder than they do other people in public life – with Democrats especially likely to respond this way. More people had an opinion on this question after the press conference, and there was a ten point rise in the percentage that believed Clinton had been more harshly treated by the media. Women are somewhat more likely than men to think this (more men than women think the press treats Clinton easier than they do other public figures). Overall, 44% say that the media has made too big a story about the emails. The press conference itself made more people pay attention to the questions surrounding the emails, but did little to affect perceptions of the issue as a serious problem. Democrats in particular became more attentive (58% of Democrats said they were following it at least somewhat closely immediately before the press conference; 73% were paying attention afterwards). Overall, those following closely rose from 61% before to 67% afterwards. Democrats were paying more attention than the public as a whole was after the conference. But perceptions of this being a scandal changed hardly at all, and were driven by partisan feelings. Most Democrats said it was not a problem at all or was just a minor one, while most Republicans disagreed. 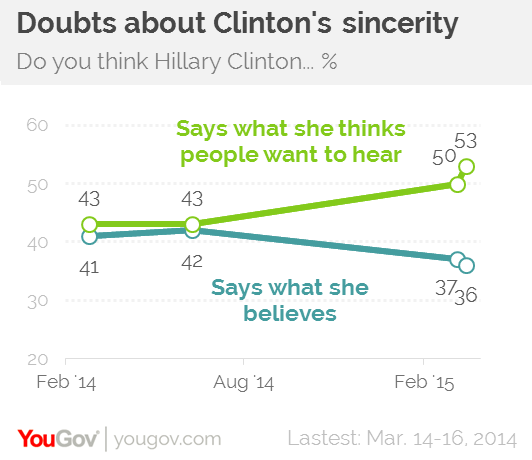 As Clinton inches closer to a presidential run there have been some changes in the way Americans view her. While she was Secretary of State, assessments of her were far less partisan than they are today. Just in the last year, perceptions of her sincerity have not improved. In fact, they have gotten worse. In Economist/YouGov polls conducted in 2014, Americans were divided on whether Clinton mostly said what she really believed or what she thought people wanted to hear. Now a majority see her as pandering to her audience. Democrats view her as saying what she believes. Clinton continues to be seen as a strong leader, even outpacing President Obama on this measure. She is still seen as the likely winner in 2016, both when it comes to the Democratic nomination and the presidency itself. 75% overall (and 88% of Democrats) say she is likely to win the nomination; 56% overall (79% of Democrats) say she is likely to win the presidency itself. 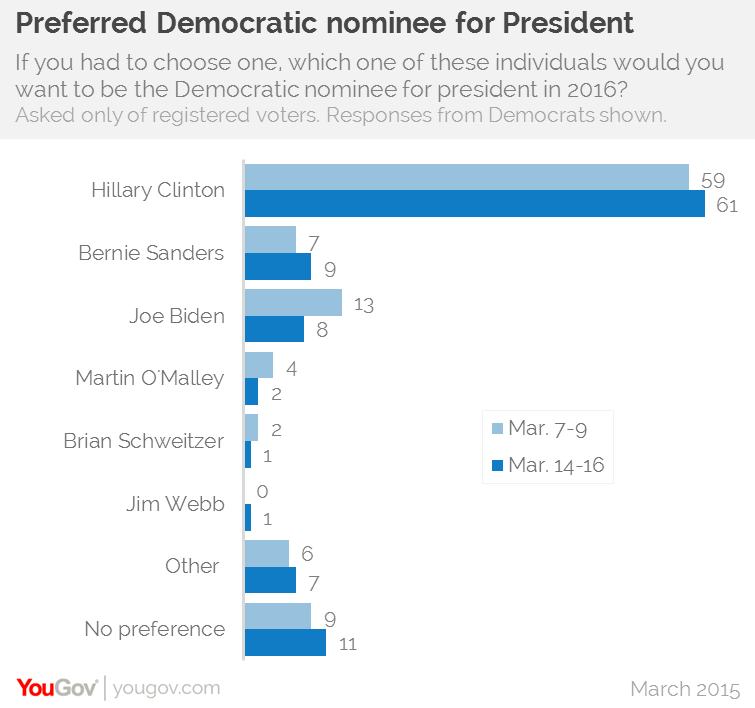 More importantly, Democrats want to see her run, although the percentage opposing a run has crept upwards over time. Democrats overwhelmingly think she is qualified for the job. In contrast, Vice President Joe Biden, who is the best known (of the group of those who are seen as potential Democratic candidates in 2016), has much less support for a presidential run. 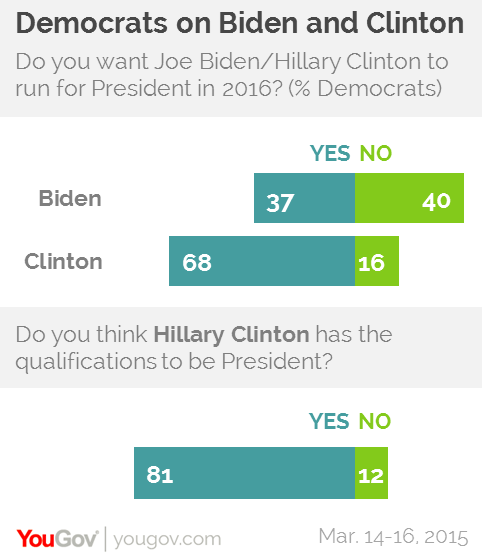 As many Democrats don’t want Biden to run in 2016 as want him to. Overall, half the total public say Clinton is qualified, while 41% disagree. 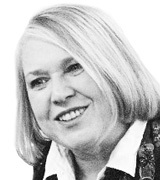 The public is divided as to whether they want her to. Democrats still overwhelmingly support Clinton for the job. If anything, in the post-press conference poll, the margin between Clinton and her nearest challengers widened.